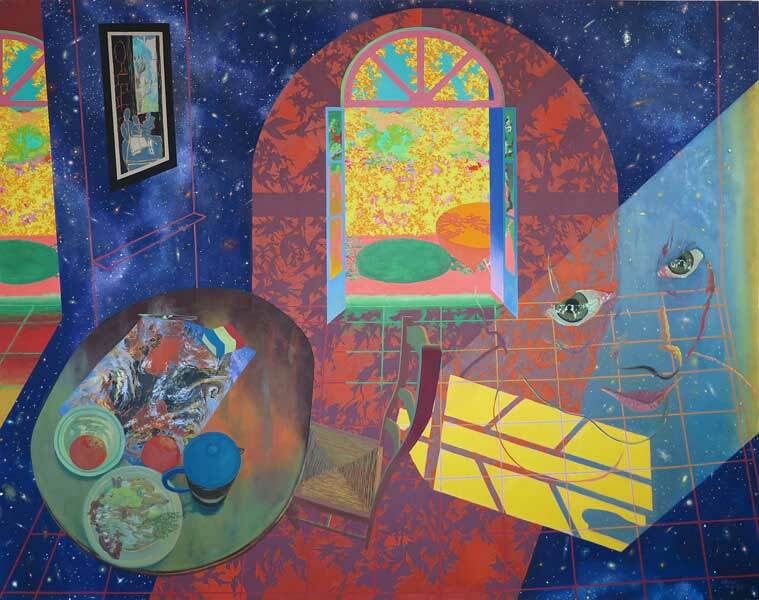 In 1977 David Royle painted his first "Interior" not knowing then that this would develop into a theme which would reappear in his work periodically throughout the next 25 years. Over time these interiors have accumulated new elements and grown into the complex layered paintings which will form the core of David Royle's next solo show at the Beardsmore Gallery early in 2004. 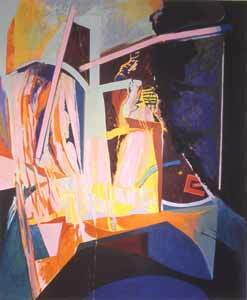 "Exposure" 2002, is a good example of these recent works, oddly lit with an atmosphere of urban anxiety. Viewed retrospectively, from the position of these recent works, it is possible to discern the key stages and insightful imaginative moments of this thematic journey from 1977 to the present day. In the early 1980's some more elements were added. The geometry of the tiles of the steeply raked floor-plane ("The Tiled Balcony" 1982) and a more involved interest in the energetic world through the window, beyond the interior ("Rain, Garden, Chinese Jar" 1982). 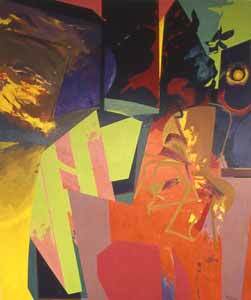 There is also a painting ("Interior Prospect" 1984) which stands a little separate from the works made around it at the time. With the steep viewpoint and extreme close-up on the figure, creating a dramatic foreground to the picture space, and with the large cast shadow it anticipates ideas which would not be more fully realised and extended in his work until the late 1990's. It is an imaginative leap. David Royle trusts his intuition because he has discovered, with experience, that these apparently discontinuous works are frequently the precocious advanced guard of later, richer developments. By the late 1980's the ambition of the "Interior" imagery had expanded considerably. Elemental imagery of fire and water was introduced often coinciding with allusions to cataclysm and the human capacity for destruction. 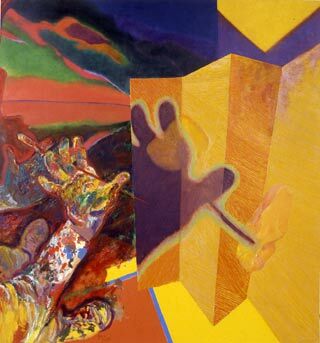 The epic pastel drawing, "Window Triptych" 1988, is typical for its use of the triptych format to enable the inclusion of all this new imagery. But, coming later, as a creative reaction to the expansiveness of the triptychs, there was a move towards compression, a desire to combine all this incident and allusion into a single surface. "Picture Window: Nightlights" of 1996 shows how this was achieved. It is as though the separate panels of the triptych format have been rendered transparent and layered on top of each other. A new layered space is achieved with reflecting surfaces creating "outside" spaces through which the "inside" spaces are discernable. These works make demands on the viewer. They are like spatial vase-heads or duck-rabbits, the eye has to choose to look at one layer and then another in turn. Despite the material flatness of the painting the eye and the attention move "in and out" of these surfaces in a way which is analogous to the shifting of optical focus from near to far and back again in the real world. 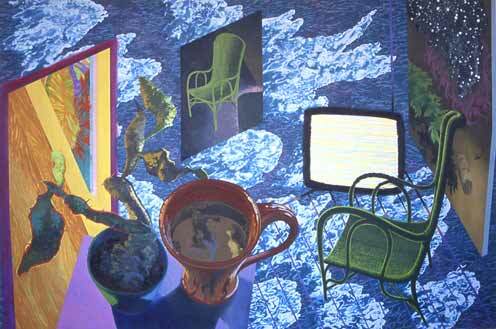 Now that the "Interiors" were implying layered spaces David Royle took another step - "into" the the paintings. The reflections had created spaces in front of the interior, now the interior was opened-up into a linear framework through which a larger, often infinite starry space was painted. The interplay of scales, inside domestic, outside elemental and vast, present in the very first "Interiors" of the late 1970's, now found a new articulation. 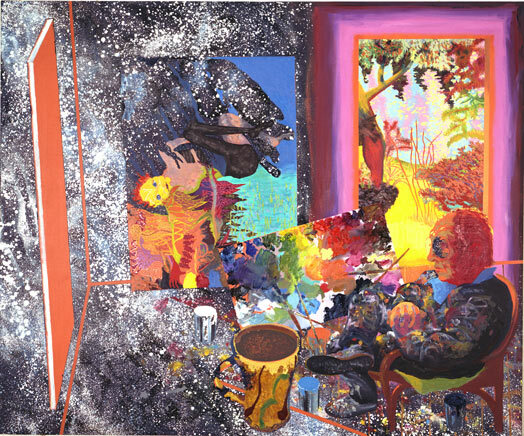 "Studio-Interior" of 1997 is a key work with its vast, spattered star-field seen through the linear space-frame of the room/studio with other spaces leading off: the garden space though the door frame and the imaginative space of the painting within the painting. A new comparison of scales and a new combination of imagery became possible. From now on this became the central pre-occupation of the paintings. 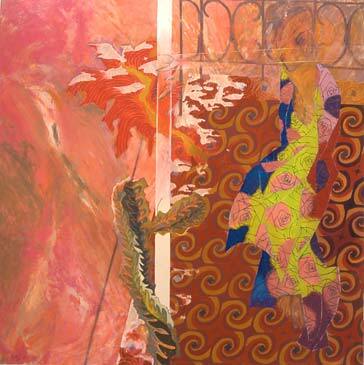 To exploit the range of scales referred to in these paintings David Royle developed a greater precision of handling. Some of the larger surfaces in particular create greater vastness by being built from many many small visual incidents. Very large "near" objects take on hugely increased proportions. This, added to the steep tilt of the linear space, puts the viewer "into" the interior and invites a very intimate subjective engagement with the painting. His subjective engagement in these paintings is not just at the level of formal spatial construction; this is the means. 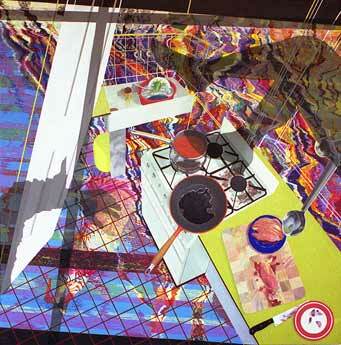 Paintings like "Living-Room", of 1999, and "Summertime Flies at Villa Maria", a year later, set up collisions if imagery which imply ideas about time, space, the forces of nature set against the ordinary domestic comforts. The paintings are sometimes unsettling, sometimes mobile and energetic and sometimes elegiac. There is a tension, the banal ordinariness of the domestic interior out-scaled by the vistas behind and through the space of the room. There is an imaginative vertigo here. 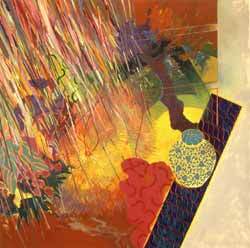 The viewer is engaged intimately in the close-up interior then nudged over the edge into the vast spaces beyond. There are two series of more recent paintings which expand these pre-occupations in different directions. The "Villa Maria Series" and the "Falling Series", each consisting of four works. The "Villa Maria Series", 2000 to 2001, draws on the heat and colour of the south of France, the idyll of passing summer set in context. The "Falling Series", 2001 to 2002, comes after the terrorism in New York. 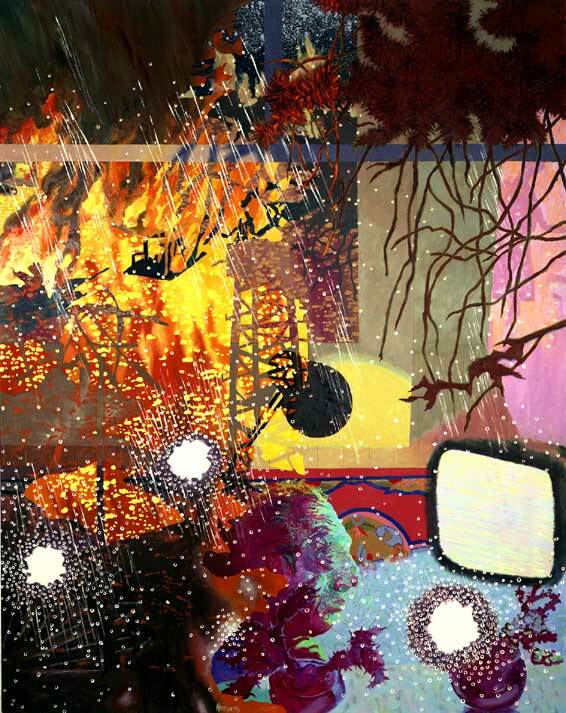 These paintings contain a stark counterpoint of banal domestic spaces, toilets, bathrooms and kitchens and catastrophic visions of falling and disaster, sometimes painted as if frozen in a giant video freeze-frame. The "shadows" crossing the surface here simultaneously add another layer of space and meaning. It is as though the shadows are being cast onto the surface of the painting from the room in which it is hanging. The real space of the viewer is implicated in the action. This urban anxiety continues into the very latest paintings currently in David Royle's studio. "Exposure", 2002, is an example. Both the urban vistas and the domestic spaces, with their flickering televisions, are coloured as though by strange synthetic lights. There is an atmosphere of night-time or uneasy twilight. Something disturbing has happened or may be about to happen. The colour is sharp and strident and at times given an extra twist of unease by being in the negative. 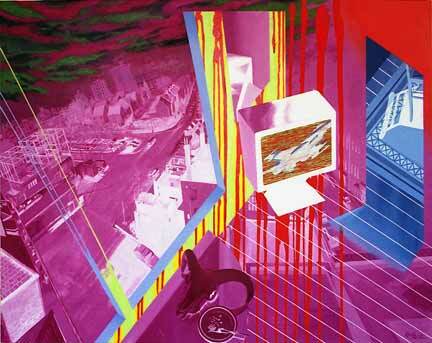 For all that these paintings are new and complex in their own way, in them can be discerned the elements of David Royle's very first "Interiors" of the 1970's: the steeply lifted interior floor plane, the interplay of exterior forces and ordinary living spaces and the sharp colours of urban electric lights.